“Is my dog overweight?” is a common question we hear at the animal hospital this time of year. When winter sets in, between the chaos of the holidays and the cold weather we experience, we frequently see pooches pack on the pounds. Things like going for hikes, long walks, and outdoor games of fetch become limited due to weather constraints and in many cases that can result in an overweight dog. Read on to help determine if your dog is overweight, and what you can do if he is or to prevent it before weight becomes an issue. Similar to their human counterparts, packing on the winter pounds is an issue for our canine companions as well. With limited activity due to winter weather, it becomes easier for dogs to gain weight that can put their health at risk. Thanks to this great chart from Las Vegas Pet Weight Loss, it’s easy to see just how your dog compares (click to enlarge). 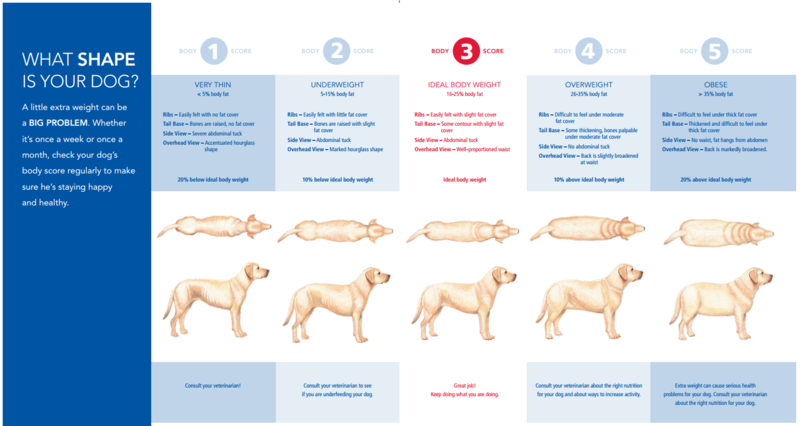 In addition, the Association for Pet Obesity Prevention has taken this one step further with a handy chart that breaks down ideal weight ranges for dogs by breed. Together, these tools are a wonderful guide to determine how your dog compares and if they are overweight. The risks of being overweight include issues such as arthritis, heart problems, and even a shorter life span, so take a moment and review your dog’s situation today! Well, that’s a great question. In the warmer months, it’s a lot easier to go for a hike, play fetch, or take a stroll around the neighborhood to get your dog’s metabolism going but in the winter that can be a bit of a challenge. Things such as indoor dog parks, agility and dog training classes, and play dates with doggie friends can all be a good way to help your dog on their path to a healthier weight. Feeding is also another way to control your dog’s weight. From reduced food amounts, as well as reduced calorie food options, you can really help your dog’s weight issues through diet as well. Some dog owners switch to a lower calorie food in the colder months when they know they won’t be able to go hiking or camping. Making the switch before the dog puts on weight makes it easier to adjust. If you’re not sure what you should be feeding or if this is the right plan of action for you, talk to your veterinarian. What about dog treats and snacks? This is a big one. A lot of people don’t realize that what may seem like a small treat to a dog may actually be packed with more calories than they need for an entire day! Did you know that as little as one ounce of cheddar cheese fed to a 20 pound dog is the equivalent of you eating two and a half cheeseburgers? Wow! Those little tidbits really add up for our canine friends. 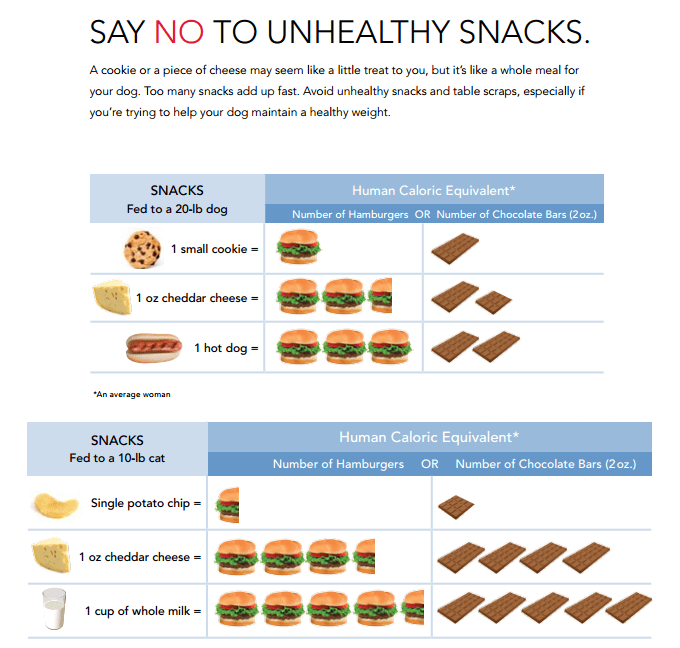 Here’s a great chart to help assess what those table snacks can translate to – so think twice before you share even a small treat. Table snacks really add up! Bonus chart for your cat, too. What are healthy dog treats? We’re glad you asked. 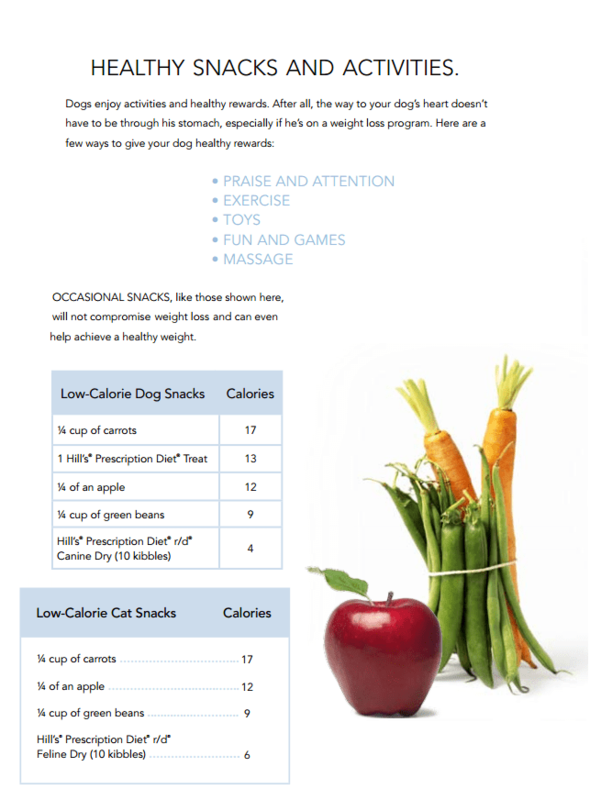 Our same friends at Las Vegas Pet Weight Loss put together this awesome chart of some healthy alternatives. Did you know that carrots are great and healthy dog treats with a lot fewer calories than traditional dog bones and cookies? So nest time you’re in the produce aisle, pick up a few extra healthy treats for your dog, too! Healthy dog treats include many vegetables from the local supermarket’s produce aisle. Bonus cat snacks here for our feline friends, too! If you think your dog may be overweight, use these tools and guides to get on the right track. Whenever there are concerns about a healthy diet as well as any issues related to weight (or otherwise), you can always contact us or your local veterinarian for an appointment to get your pet on the track to a healthy weight today!